A new software bundle from publisher Macware delivers 16 system utilities to your Mac. 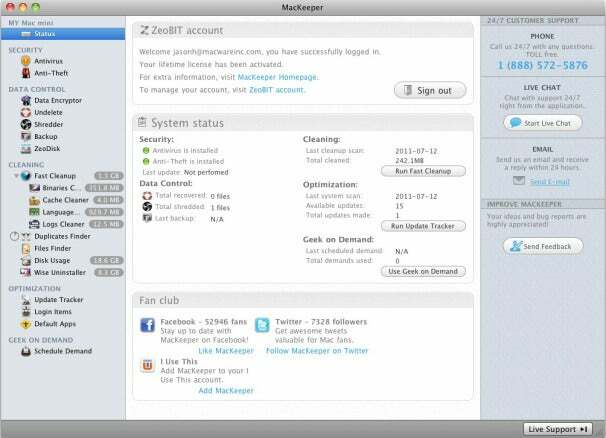 Developed in partnership with ZeoBIT, the MacKeeper bundle aims to tackle everything from security to file management. Specific offerings in the MacKeeper bundle include: Antivirus for Mac, Anti-theft, Fast Cleanup, Uninstaller, Geek on Demand, Backup, Update Tracker, Duplicates Finder, Shredder, Undelete, Login Items, Data Encryptor, Default Apps, Disk Usage, and Files Finder. Macware says its bundle will protect your computer from viruses, identity theft, phishing, malware, spyware, and unsafe downloads by automatically detecting and removing them from your Mac. And should someone steal your computer, MacKeeper will track the Mac’s location; it can even take a snapshot of the thief for you if your Mac has a built-in iSight or FaceTime camera. The bundle’s cleanup feature finds and removes junk files on your hard drive, and includes specific functions such as a cache cleaner and logs cleaner. If you have a lot of unused applications or plugins, the uninstaller will be useful. It removes applications completely, including the stuff that’s left over after you put something in the trash. But let’s say you accidentally deleted something that you want back—the bundle’s undelete capabilities can recover those files. Other capabilities offered in the bundle include the ability to find and remove duplicate files, permanently delete files via the Shredder function, and hide and password-protect sensitive information through Data Encryptor. MacKeeper also offers technical support on anything having to do with your Mac, iPhone, iPad, or iPod touch; it guarantees an answer to any question within 48 hours of you submitting a problem through the bundle's Geek On Demand offering. A lifetime license of MacKeeper is available on the Macware site for $40; it requires Mac OS X 10.5 or later. You can also get a deal when buying multiple licenses at once—two licenses cost $70 and three cost $90. Macware says that MacKeeper will be available in retail stores soon.